This is a Stunning Vintage Oyster plate / platter made by Gabriel Fourmaintraux, near Vallauris, France circa 1960’s. 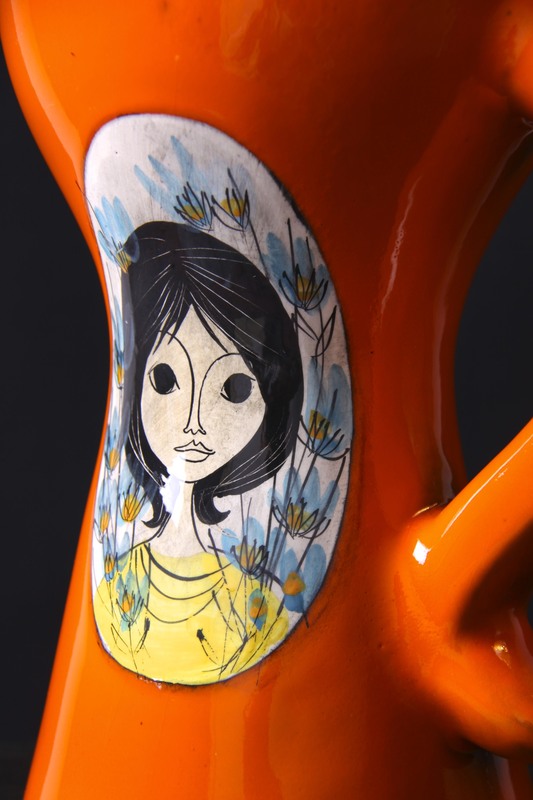 A Wonderful piece of French art pottery Majolica / Faience ware, by this renowned potter, who collaborated with the artist Fernand Leger influencing his style as Picasso did for many other Vallauris potters. With its lovely contoured form, gently rippled, with 6 wells for oysters or shellfish, and another for lemon, wonderfully stylised, having an underwater, rockpool appearance. Stunning glazes, the glossy black base has foamy aqua trails in blue and green, contrasting with the vibrant shocking orange wells, highlighted with foamy gold and the lemon rim in yellow! 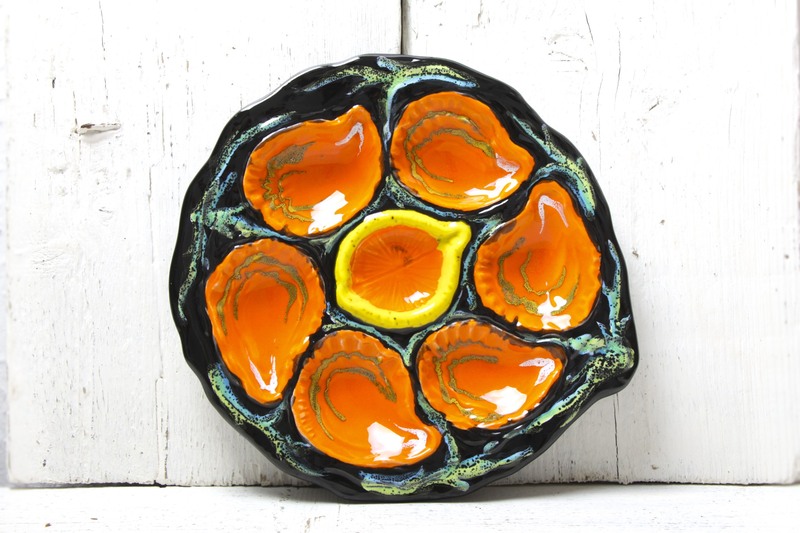 A real statement piece of mid century French art pottery, very reminiscent of the era, and perfect to brighten up any dinner party table or retro kitchen. Hand signed to the base GF ‘fait main’ (hand made). Measures 26 x 24 x 3cm / 10.25 x 9.5 x 1.5in. 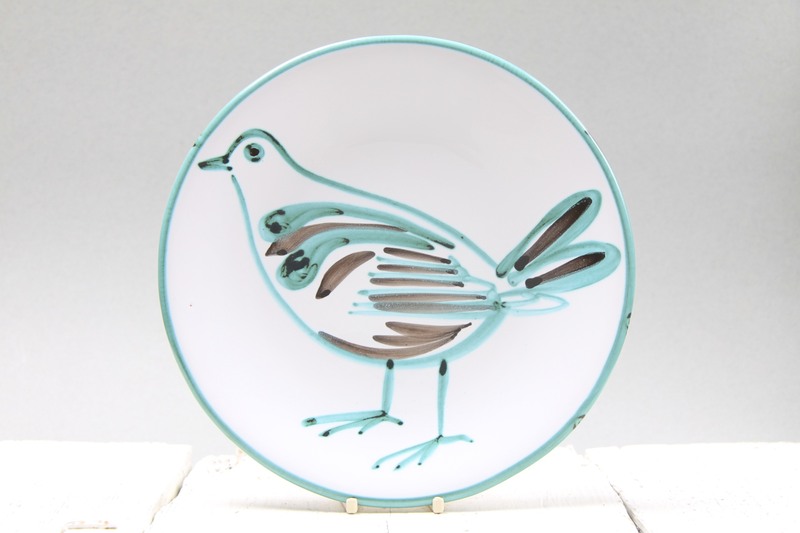 This is a Beautiful decorative plate / wall plate with bird / dove motif by Robert Picault, Vallauris, France circa 1950’s / 60’s. 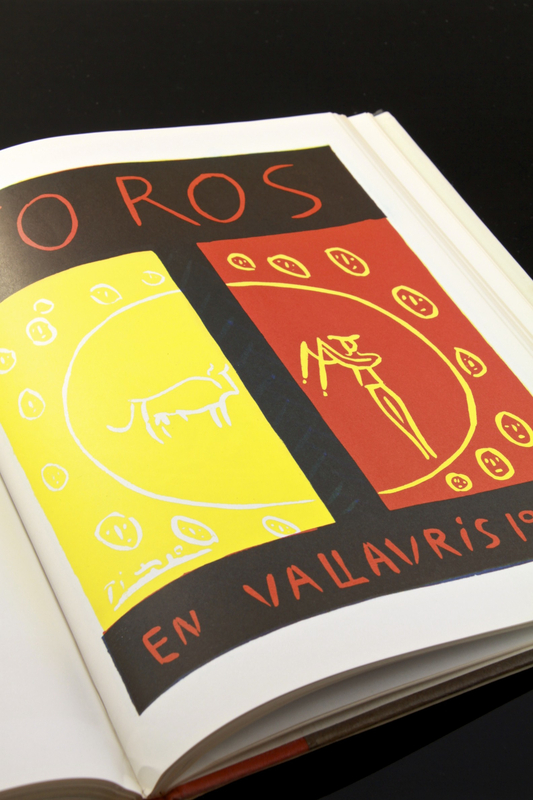 Vallauris is a pottery region in south-eastern France, Picasso lived here from 1948 – 55 and greatly contributed to the renaissance of the pottery industry, this legendary golden age when everyone was a potter, including famous ceramicists Roger Capron and Charles Voltz. Their influence is clearly seen in the abstracted painterly decors. 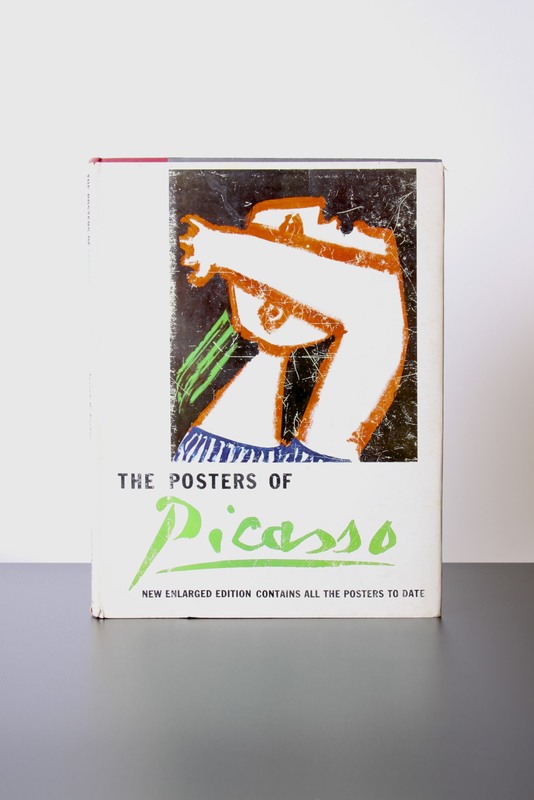 Picault had worked with Capron and was a friend of Picasso’s. His handpainted style used Mediterranean colours, turquoise blue, green and brown with repeated geometric abstract motifs, and sometimes birds as seen on this plate. Very stylised possible a Dove, the bird is simply rendered in turquoise green and black thick brushstrokes, very similar to Picasso’s work for the Madoura pottery. Would make a Fantastic addition to any collection of Vallauris / French / European / Studio pottery, and would complement any retro, vintage, mid century, 50’s, 60’s, Mediterranean, French or contemporary styled interior. In Excellent Condition, no marks, chips or scratches. 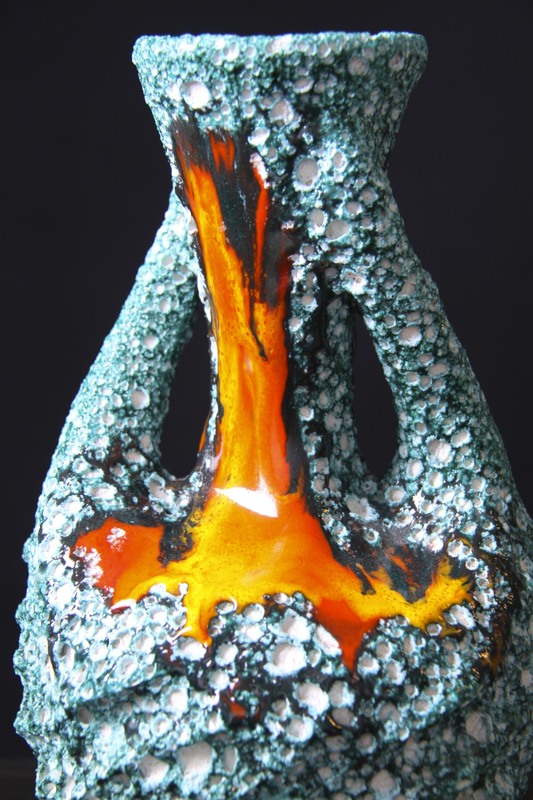 Some crazing commensurate with age, and a tiny firing dot in the glaze (pictured). Measures 23 x 23 x 2.5cm / 9 x 9 x 1in. Handpainted mark to the base ‘RP. 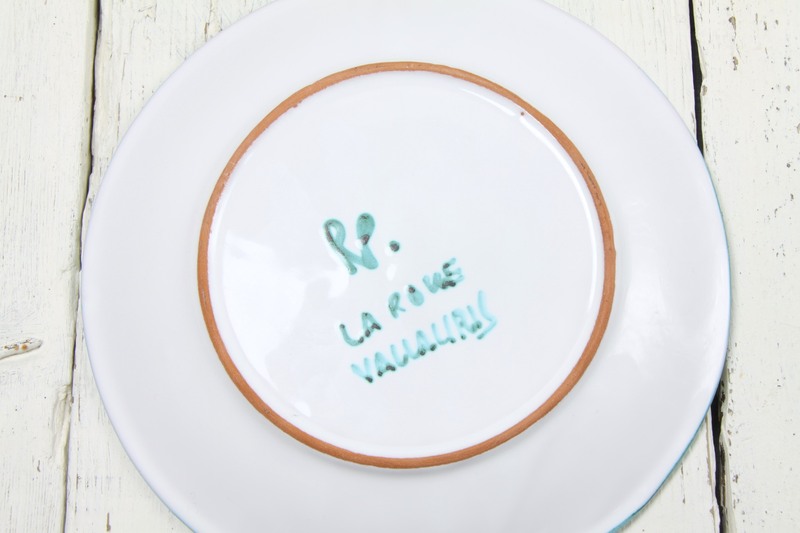 La Roue Vallauris’. La Roue / The Wheel was a pottery workshop in the town. 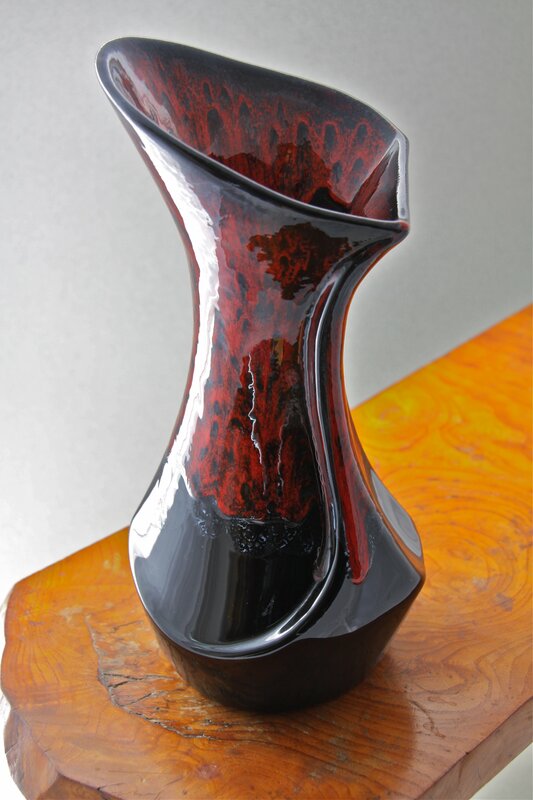 This is a Stunning Vallauris Studio pottery vase, France circa 1960’s. 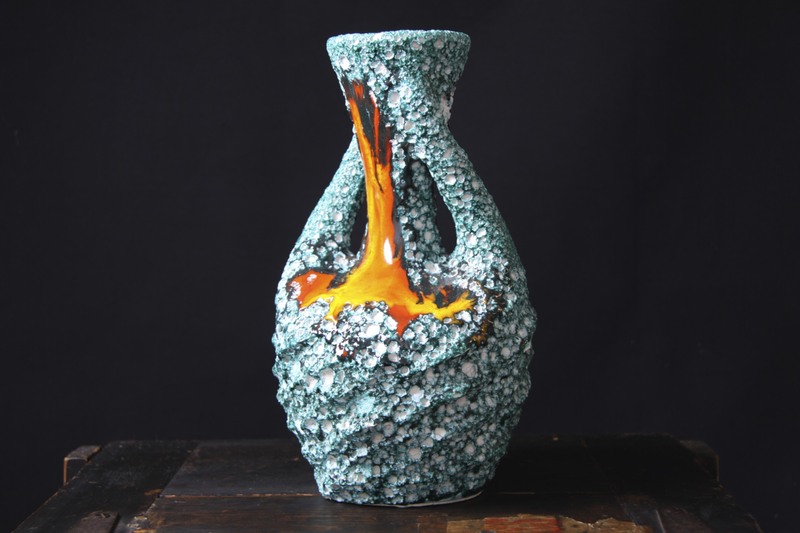 Characteristic of Studio pieces of the era from this region, with the classical double handled form, and the very crusty volcanic glaze in turquoise over a white base. Highlighted with flamelike drip glossy glazes in red and orange. Very similar to ‘Fat Lava’ decors from Germany, very Striking and Vibrant with its coral like appearance and contrasting glossy ‘flame’. A Real Statement piece of European Art Pottery. 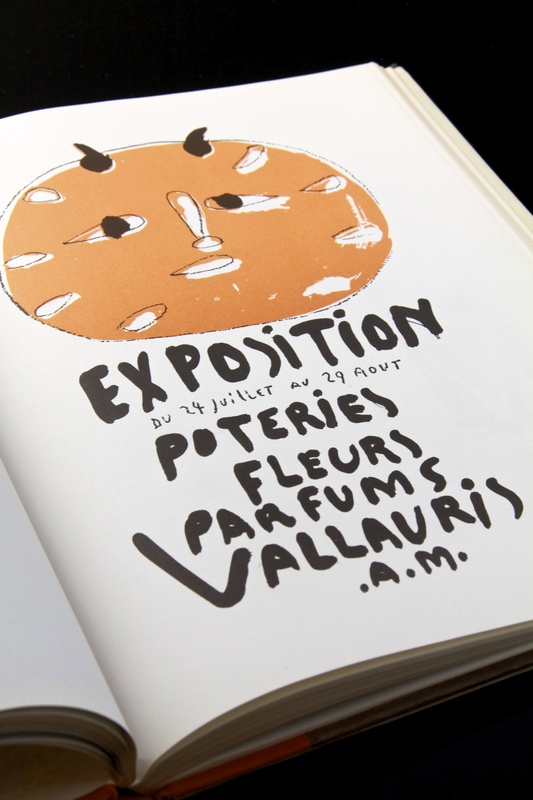 Vallauris is a pottery region in south-eastern France, Picasso lived here from 1948 – 55 and greatly contributed to the renaissance of the pottery industry, this legendary golden age when everyone was a potter, including famous ceramicists Roger Capron and Charles Voltz. 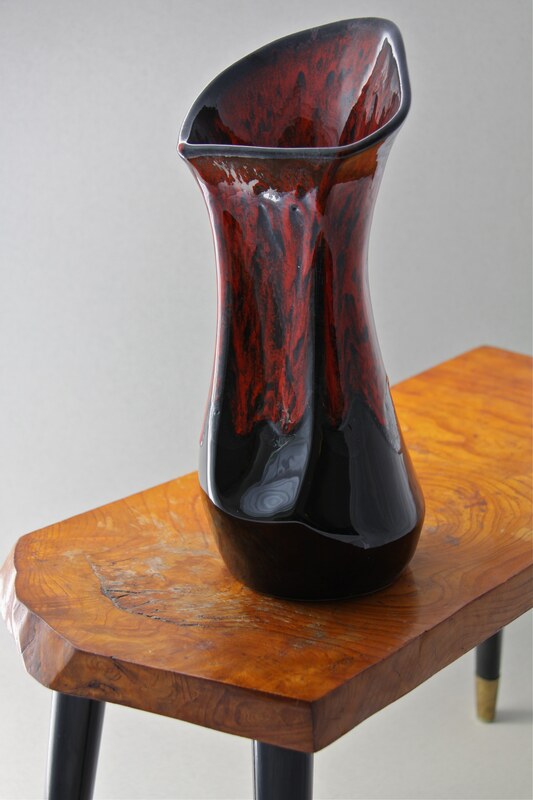 His influence is clearly seen in the abstracted forms of pieces such as this vase. Would make a Great addition to any collection of European studio pottery, and would complement Vallauris or Fat Lava pieces. 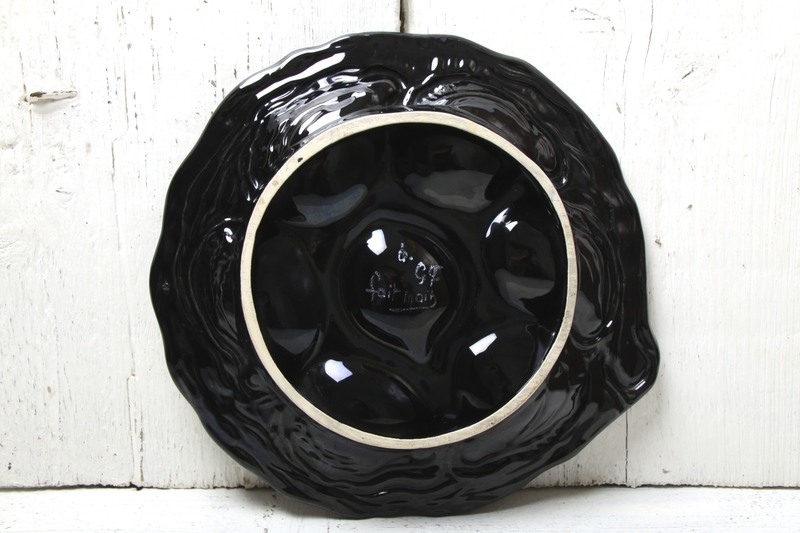 A perfect vase for any retro, vintage, 1950’s, 1960’s, kitsch, mid century modern, modernist or contemporary interior. In Great Condition, a few of the bubbles may be ‘burst’ due to the extreme crusty glaze, pictured are one on the rim and base. They do not detract from the overall ‘Fat Lava’ look. The glossy glazes are crazing free, no chips or cracks! Measures 27 x 15 x 15cm / 10.5 x 6 x 6in. 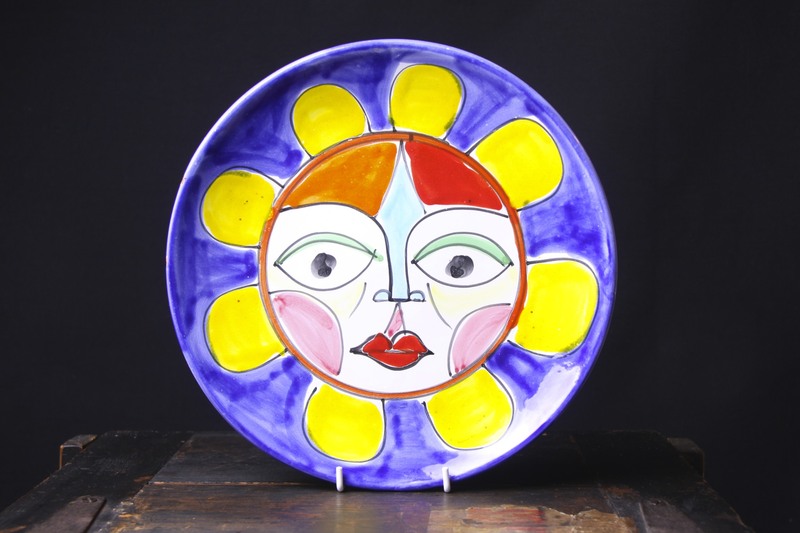 This is a Beautiful Colourful Italian wall plaque / plate by La Musa, Italy circa 1960’s. 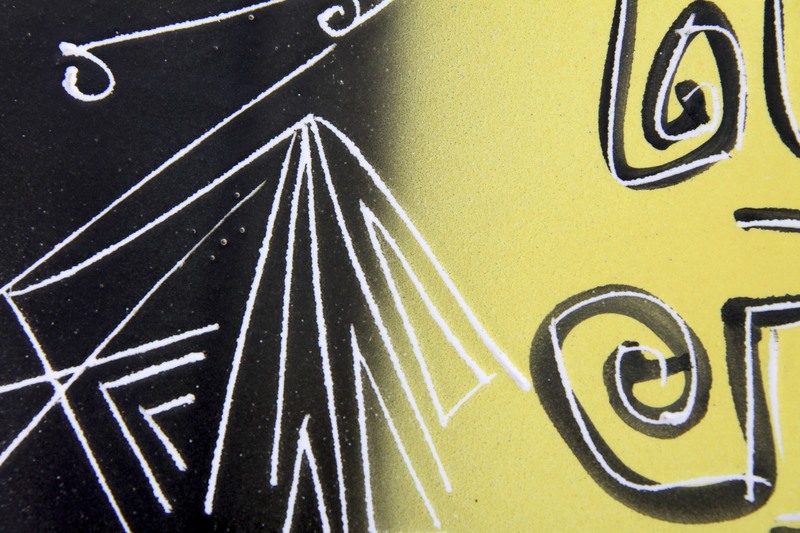 A Fantastic bright design, with a highly stylised image of the Mediterranean sun. Its broad brush strokes, flat panes of colour, bold outlines and Cubist style are very similar to the paintings of Picasso and Matisse. La Musa, Palermo, Sicily founded in 1949 along with the renowned Desimone pottery produced fabulous pieces bearing this hallmark style, so reminiscent of the region and the mid century era. A Wonderful plaque for wall hanging, or for use as a bright addition to any table centrepiece. 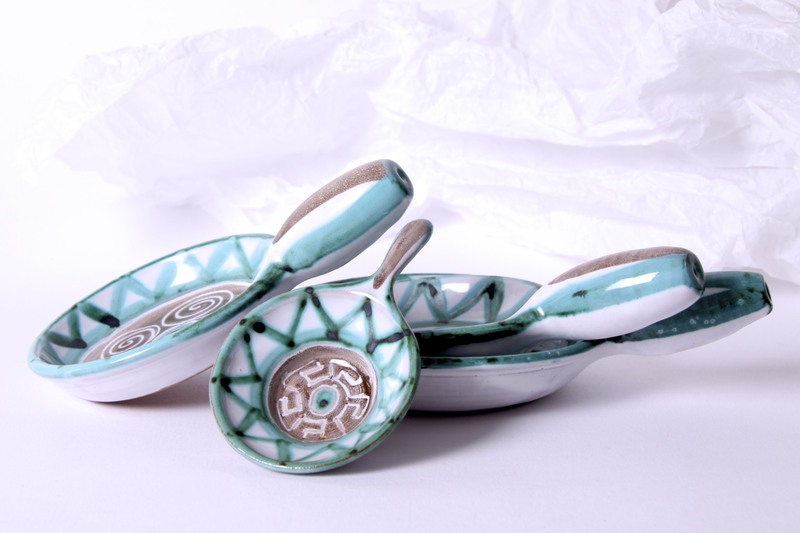 A Great addition to any collection of Italian, Mediterranean or European studio pottery. Would add a splash of colour to any retro, vintage, mid century, 60’s or contemporary interior. In Great Condition, two chips to the glaze on the rim, do not detract on display. Measures 25 x 25 x 3cm / 10 x 10 x 1.25in. Printed marks to the back are mostly worn off, there is a hole for wall hanging in the rim. 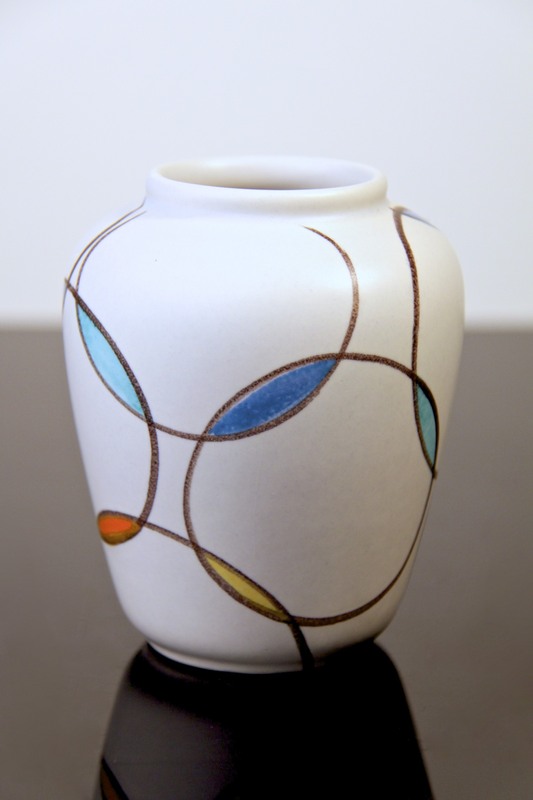 This is a Beautiful and Rare French ceramic handled vase by Jean de Lespinasse, Nice, France circa late 1950’s / early 1960’s. 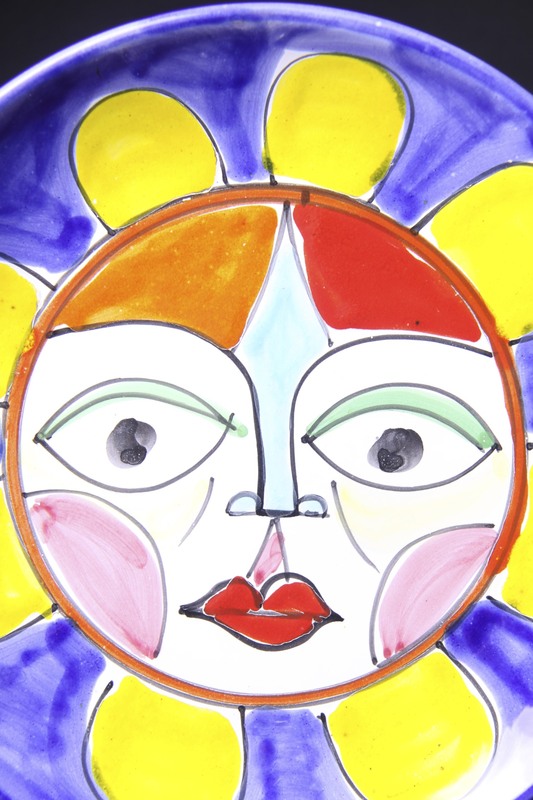 Jean de Lespinasse was a French ceramicist who worked from a studio in Nice on the French Riviera. His work was sold in Paris, Vallauris and abroad, his contemporaries included Roger Capron, Madoura with Picasso and Robert Picault. A Wonderful form, very chunky and heavy, with its pinched waist and flared rim complemented by the thick elegantly curved handle. 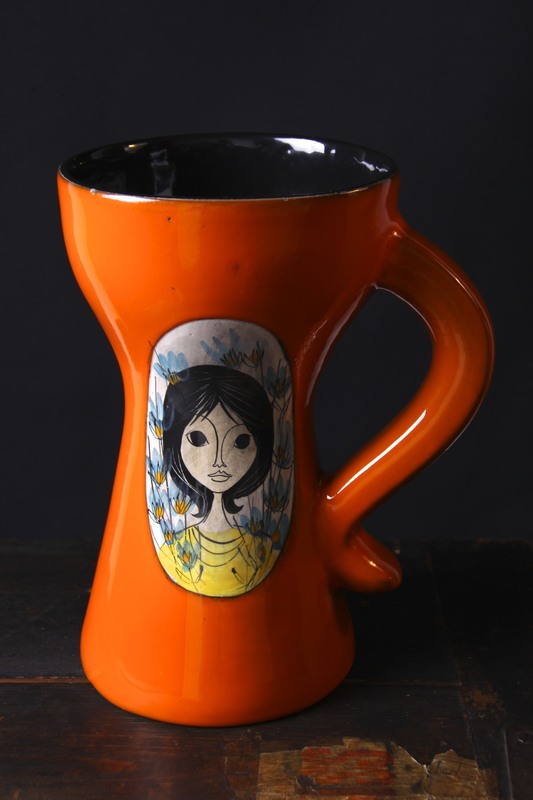 In a bright glossy orange glaze, contrasted by the black interior, decorated with a beautiful stylised image of a lady surrounded by flowers, very reminiscent in style of the 50’s / 60’s era. 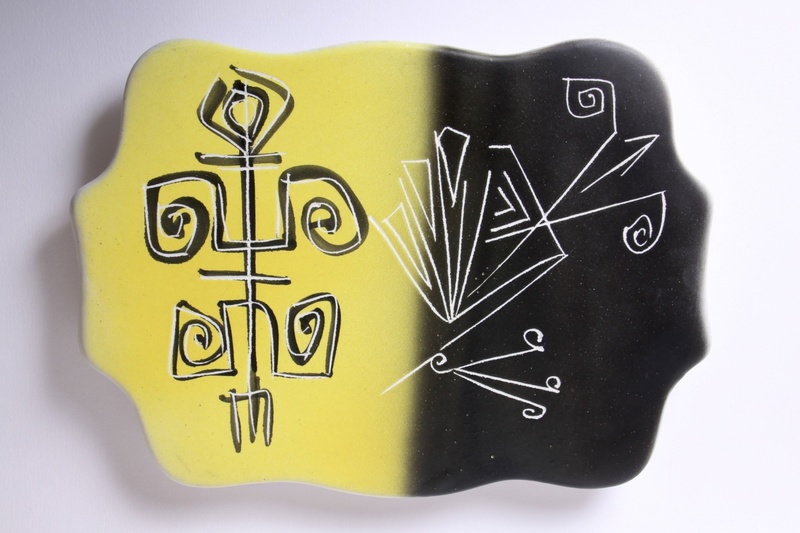 Would make a Fantastic addition to any collection of French Studio Art pottery, European / Vallauris ceramics, and would complement any retro, vintage, mid century, 50’s, 60’s, pop art, minimal or contemporary styled interior. In Great Condition, a couple of small missing glaze chips on the rim, pictured, nothing to detract from the overall stunning look. Measures 25 x 20 x 16cm / 10 x 8 x 6.25in. Hand signed to the base JDL 402. This is a substantial chunky vase weighing almost 2kg, overseas bidders please enquire for a courier postage cost, reductions available on combined shipping. 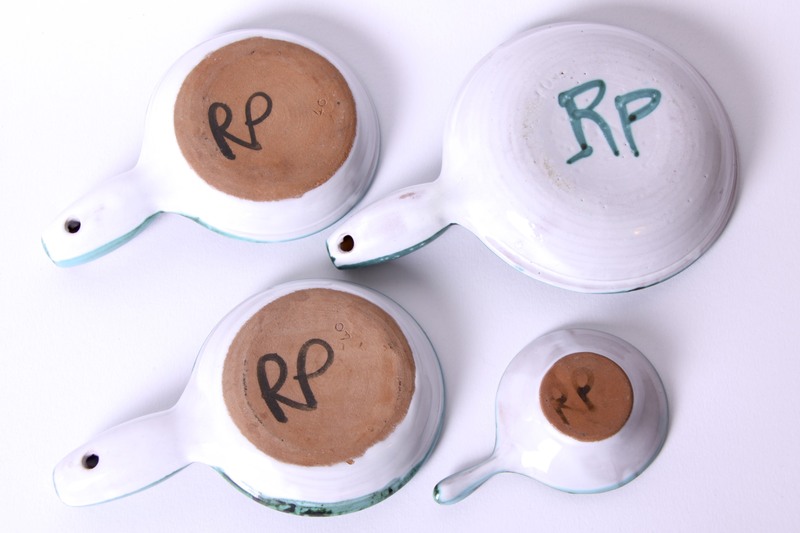 These are a Beautiful Set of 4 handled bowls by Robert Picault, Vallauris, France circa 1950’s / 60’s. Vallauris is a pottery region in south-eastern France, Picasso lived here from 1948 – 55 and greatly contributed to the renaissance of the pottery industry, this legendary golden age when everyone was a potter, including famous ceramicists Roger Capron and Charles Voltz. Their influence is clearly seen in the abstracted forms of pieces such as these handled bowls. Picault had worked with Capron and was a friend of Picasso’s. His handpainted style used Mediterranean colours, turquoise blue, green and brown with repeated geometric abstract motifs. 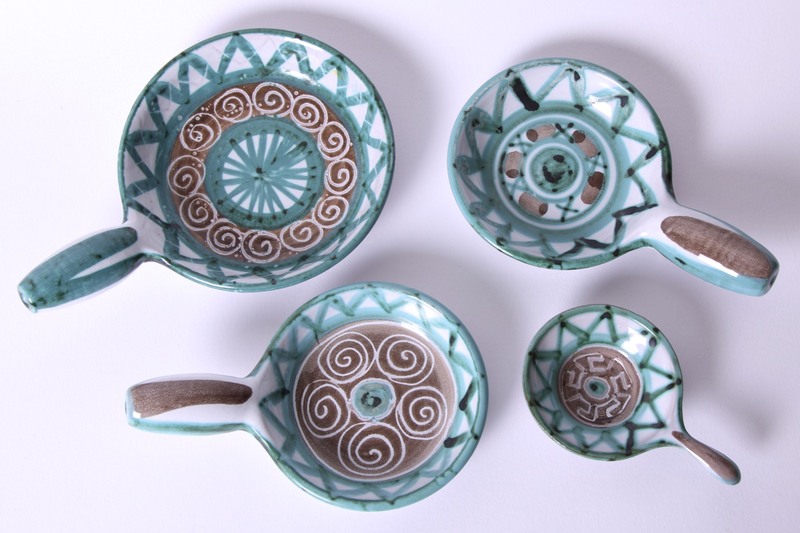 Each of these bowls has a different pattern, but are all united in the glazes used and motifs carried across each piece. The handles of the largest 3 pieces have holes to allow for hanging, so could make a great wall or dresser display. Measuring: Largest 20 x 13 x 5cm / 8 x 5 x 2in. 2 x Middle size 17 x 10.5 x 4.5cm / 6.75 x 4.25 x 1.75in. Smallest 11 x 7 x 2.5cm / 4.5 x 2.75 x 1in.